Background: Medicinal plants are rich source of large variety of lead compounds. The plants of genus Glycosmis or its different parts valued for its therapeutic and medicinal qualities. Glycosmis belongs to the family Rutaceae. Objective: The genus Glycosmis is a rich source of pharmacologically and biologically active secondary metabolites, such as alkaloids, flavonoids, phenolic glycosides, quinones, terpenoids, glycerides isolated from different parts of Glycosmis plant. The objectives of this review is to provide updatedand complete information on the distribution, phytochemical, pharmacological, and toxicity research of Glycosmis species. Results: About 233 phytoconstituents are isolated from this genus. Recent interest in this genus has focused on isolating and identifying of different phytoconstituents that exhibit potent antioxidant, antibacterial, antiviral and anticancer activities. They show good cytotoxic activity against various cancer cell lines and also reported for good antiviral and immunomodulatory activity. In this support convincing evidence in experimental animal models are available. 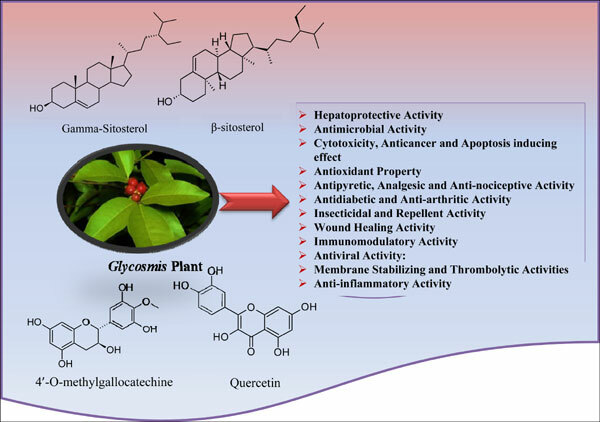 Conclusion: This review summarizes information about the isolated compounds their bioactivities related to same compounds present in other plants including pharmacological activities of plant extract of Glycosmis genus. Glycosmis genus, cytotoxicity, phytochemistry, pharmacology, medicinal plants, biologically active secondary metabolites.